In an almost must-win situation at home, the Cleveland Cavaliers started Game 3 against the Golden State Warriors motivated, as they quickly built up a 10 point lead. But as the game progressed, the Cavs’ play became sloppy, and Kevin Durant took over, eventually leading the Warriors to a 110-102 victory. Now The Warriors have a commanding 3-0 lead in the NBA Finals. With 7:38 to play in the first quarter, the Cavaliers held a 16-4 lead. However, by the end of the opening period, the score was 29-28. At 5:24 in the second, Cleveland had padded its lead, up to 50-37. 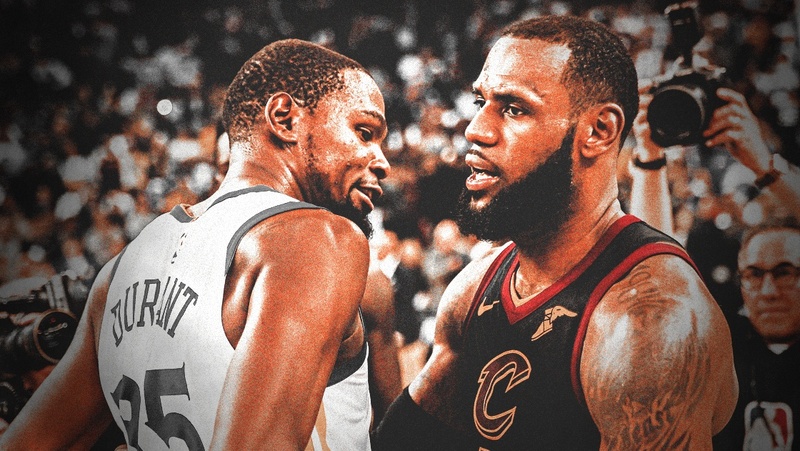 The score was 58-52 heading into halftime, and while the Cavs had played pretty well, they had allowed the Warriors to remain in the game, and that would come back to hurt them later on. Just three minutes into the third quarter, the Warriors took a 63-61 lead, and that’s when things began to fall apart for the Cavaliers. Cleveland would finish the third down 83-81. Kevin Love gave the Cavs a 97-96 advantage with 3:11 to play, but Golden State’s offensive firepower would prevent Cleveland from ever leading again. Stephen Curry picked a great time to make his only three-pointer of the game, as he gave the Warriors a 101-97 lead with 2:38 remaining. After James responded with a triple of his own, Andrew Igoudala dunked to make it 103-100. After that, Kevin Durant hit a dagger 33-foot three-pointer to give Golden State a six point lead with under 50 seconds left. While there are some silver linings, this was a demoralizing loss for the Cavs, who in all honesty should have a 2-1 series advantage at this point. Especially in the late third and early fourth, Cleveland all of a sudden began to push the pace, taking bad shots early in the clock, which led to many fast break points for Golden State. The Cavs played right into the Warriors’ hands, and paid the price for it. As a team, the Cavaliers shot 40-92 (44%) from the field and 9-31 (29%) from beyond the arc. During the game, it felt like the Cavs were shooting much better from deep, but that’s probably because Kevin Love was 3-5 in the first half, and J.R. Smith was 2-4 in the same span. But Smith went 1-6 for the rest of the game, and LeBron James was just 1-6 from distance overall. Cleveland hit 13 of its 17 free throws, which all came in the second half. On the glass, the Cavs dominated the Warriors, winning the rebounding battle 56-41, including a 15-6 advantage on the offensive side. 14 turnovers led to 11 extra points for Golden State, although the Cavs did score 19 off of 11 miscues by the Warriors. Those numbers were reversed in transition, as the Warriors scored 19 to the Cavaliers’ 11. If you weren’t able to catch the game and were just looking at the box score, you would see Stephen Curry’s performance and think “well the Cavs obviously won”. After all, Curry was an abysmal 3-16 from the field, including 1-10 from beyond the arc. He also had two turnovers. He totaled 11 points, and two of those came on free throws after the game was out of reach. But when one of the Warriors’ MVPs is having a career-worst day, the other has his best playoff performance. Kevin Durant was simply unstoppable, and he is the reason why Golden State won. In addition to his seven assists and 13 rebounds, he scored 43 points on 15-23 shooting, including 6-9 from deep. Nothing the Cavs did even slowed him down. Jeff Green, LeBron James, and Rodney Hood defended Durant decently, but it was all in vain. After Durant, the rest of the Warriors had pedestrian nights. Draymond Green scored 10 and had four fouls and two turnovers to his two rebounds. Klay Thompson had 10 points on 4-11 shooting. Andre Igoudala, Shaun Livingston, and Jordan Bell scored all 26 of Golden State’s bench points. JaVale McGee again took advantage of his size mismatch, scoring ten in his 14 minutes of play. For the Cavs, LeBron James lead the way with a 33 point, 10 rebound, 11 assist triple-double. He also added two blocks and two steals, but also four turnovers. He had many 1-on-1 matchups against Stephen Curry late in the game, but did not do enough with them. Despite the stat-line, James was not at his best, and that has to be partly attributed to exhaustion. He has played in all of Cleveland’s 103 games this season, and the Finals games played at the Q allow for only two days of rest for each. Kevin Love turned in his best performance of the series, with 20 points, 13 rebounds, three assists, and a steal. After going 9-20 and 7-18 in the first two games, Love shot a solid 6-13 from the field and went 3-7 from deep. He was notably more aggressive, looking to actually make the shot rather than drawing a foul. Five of his rebounds were on offense, and those second-chance points were crucial in keeping the game close. Tristan Thompson had a decent night, with eight points and seven rebounds. George Hill had five points, four assists, and four turnovers. J.R. Smith had 13 points and three steals, but his shot selection worsened late in the game and cost the team multiple possessions. Larry Nance Jr. and Jeff Green were quiet in their 31 minutes of play, combining for eight points and three rebounds. Green’s role was reduced, as he played for just 18 minutes after logging nearly 36 in game 1. After two terrible performances, Jordan Clarkson was benched, and his minutes were given to Rodney Hood, who also ended up eating some of Green’s playing time. Hood totaled 26 minutes, scoring 15 points on 7-11 shooting (although his final miss came with two seconds left and was irrelevant even if it had gone in) and added six rebounds and two blocks. His ability to score in isolation breathed new life into the Cavs’ offense, and he was quite good on defense for the most part, although towards the end of the game it appeared as if he and his teammates, namely Smith, weren’t sure what the other was going to do on switches, which can be attributed to a lack of chemistry from Hood’s lack of playing time. Still, when Hood was on the court, he primarily guarded Thompson and Curry, and did a very good job. His 6-foot-8 height makes him a tough defender to beat, and he has the athleticism to stick close to smaller guards. He will definitely get significant minutes in Game 4. The Cavaliers were unable to capitalize on a poor performance from Stephen Curry, both because of their own mistakes and Kevin Durant having a career night. It’s just another disappointing loss that the team will regret. They have just one more shot to extend the series; if nothing more, they’re playing for pride now. No one expected them to be able to beat this Warriors team, yet they have nearly won twice. Taking the fourth game in Cleveland would be a great morale boost to both the team and the fanbase.